The province ups the ante on distracted driving. Increased fines, escalating demerit points and driver's licence suspensions are about to become the new reality for drivers convicted of distracted driving in the province. Effective January 1, 2019 the penalty for your first distracted driving ticket will come with a maximum fine of $1,000, three demerit points and a three-day driver's licence suspension upon conviction. And it only gets worse for repeat offenders. If within five years you're convicted of distracted driving for a second time the maximum fine increases to $2,000, the demerit points added to your licence will be six, and this time, the licence suspension will last seven days. A third conviction could result in a $3,000 fine, six demerit points and a 30-day suspension. For novice drivers who are still navigating the graduated licensing system and don't yet hold their full G or M licence, the financial penalties are the same. However, instead of demerit points the licence suspensions are considerably longer. A first conviction for distracted driving comes with a 30-day licence suspension, for a second it will be 90 days, and for a third conviction the driver's licence will be cancelled altogether. With these types of fines and penalties in place, the province is aggressively trying to get the attention of all drivers to encourage them to focus on the task at hand. Avoid a potential ticket and the hit to your auto insurance premiums with the following ways to reduce distractions when you're on the road. Plan your route in advance. If you'll be using a GPS, program it before you leave and enable the feature so that it calls out the instructions, so you can keep your eyes on the road and not on the screen. Select the playlist or radio station you want to listen to and adjust your seat, mirrors and climate control settings before putting the car into drive. Activate the setting on your phone that limits the call, text and email notifications you receive while driving. If your phone is connected to your vehicle's Bluetooth, or some other hands-free accessory, keep your conversations short and simple. Avoid emotional conversations that take your mind away from what's happening on the road. Distracted driving isn't just about the electronics we've come to rely on either. Groom yourself at home (or at your destination) and avoid eating or drinking when behind the wheel. 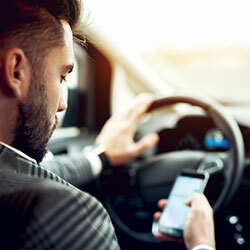 Safety concerns and hefty penalties aside there's another reason to not drive distracted: the auto insurance implications of having a ticket and licence suspension on your driving record. With both on your record you can likely expect to pay considerably higher Ontario car insurance premiums for about three years. Don't let your devices drive you to distraction because that call, text, or email can end up costing you dearly.